Portable seating is, to me, an indispensable item when I go camping. Whoever first designed those folding camp chairs that have their own carrying bag deserves a big pat on the back. They're not only great for camping but for taking to parades, picnics, soccer games, baseball games, outdoor concerts or anywhere else where it's nice to be able to have your own seating and not have to sit on the ground or stand. A company called "Tent Chair" has taken the folding chair and added a canopy to it for protection from the sun and light rain. The canopy is detachable which is nice on those days you want to enjoy a little bit of sun. There's also a front storage pocket on the chair which is a great place to store your snacks and sunglasses; along with cup holders in the armrests. It comes in several solid colors as well as some collegiate and racing themes such as a black and white checkered one for Nascar fans; although the colors and designs available change periodically. 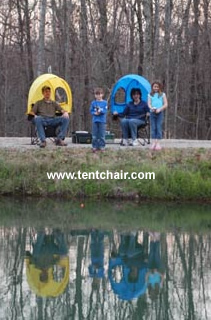 For more information about the chair or to order one, go their website at www.tentchair.com or call them at 800.828.1554.